Welcome to LPL, LED Pool Light . 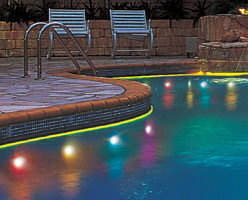 In using new light source LED (RGB), as a good decoration for pool application with its great design and high class surface, LPL can create various color changing effects. Unlike the LED AQUA which is suitable for fountain, the LPL is more suitable for swimming pools for the water surface lighting. The LPL has a simple non DMX controller LNA-DIA-12-12V-UL-05 in which the operating software has been set in it, so it plays automatic lighting effects. The LPL uses 360 Ultrabright LEDs (120 red, 120 green and 120 blue). LPL is niche-mounted fixture, and there are three styles: round, oval and fish. Static Color frequency: one color twinkle quickly with strong light. Installation Location: 40CM-200CM below water surface. LNA-DIA12-12V-UL-05 LPL SWITCH AND SIMPLE CONTROLLER. WITH 1 PC POWER CORD PLUS INPUT MALE PLUG AND 1 PC FEMALE OUTPUT PLUG, CAN CONTROL UP TO 120 LPL IN SYNCHRONY.